UGH. SO BAD. I was listening to the English version of Ponyo’s theme song IRONICALLY and Disney’s voodoo magic made me actually LIKE IT. Here be the finished piece! (A photo, sorry for the quality!!) 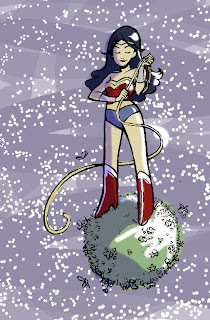 Please support Wonder Woman Day (on October 25) this year by submitting art, bidding on art, attending the event, or just picking up Wonder Woman and giving her story a try! Success! On to masking everything!!! Ahhh, it is a glamorous life, this. 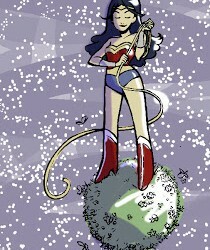 Here’s a digital mock-up for the Wonder Woman piece. I will watercolor it, but to help myself plan out color and lighting, I need to play around with it digitally first. Someday I hope to be able to visualize things in color, but right now my brain works in grayscale. 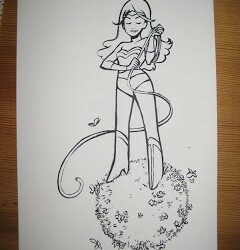 Progress photo for my Wonder Woman Day 4 piece (If you’re an artist, consider contributing a piece!!). Overall, I like it so far despite some little quibbles. I have to touch up the inking, make the lines bold and crisp, and add some weight in certain areas, then it’s on to color (plus, you know, backgrounds are a good thing). I made one big mistake, though: Art Media was out of hotpress watercolor paper in the weight I wanted, so I went with coldpress. AGH. Too much texture!! My linework looks broken and fuzzy…I can’t get the brush to move along without a drybrush effect.